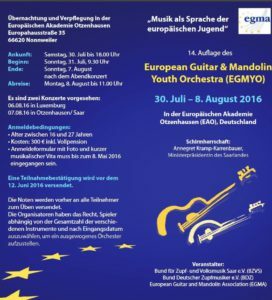 Last summer the EGMYO (European Guitar and Mandolin Youth Orchestra) has met in Germany for a workshop and two concerts. The workshop was organized by the Bund Deutscher Zupfmusiker (German plucked strings association). Now a set of videos about the workshop and the concerts is available. The workshop took place from July 30 to August 8 in the European Academy Otzenhausen (EAO) in Saarland in Germany. The participants were about 50 young mandolin and guitar players from whole Europe, from Portugal in the south to Scotland in the north of Europe. EGMYO 2016 – The Movie presentsthe participants, the team, the accordion-soloist Daniel Roth, the organisation, the rehearsals and the program in detail. The composer Marcel Wengler explains his composition “Konstellationen” which some of the players named the most interesting composition of the program. 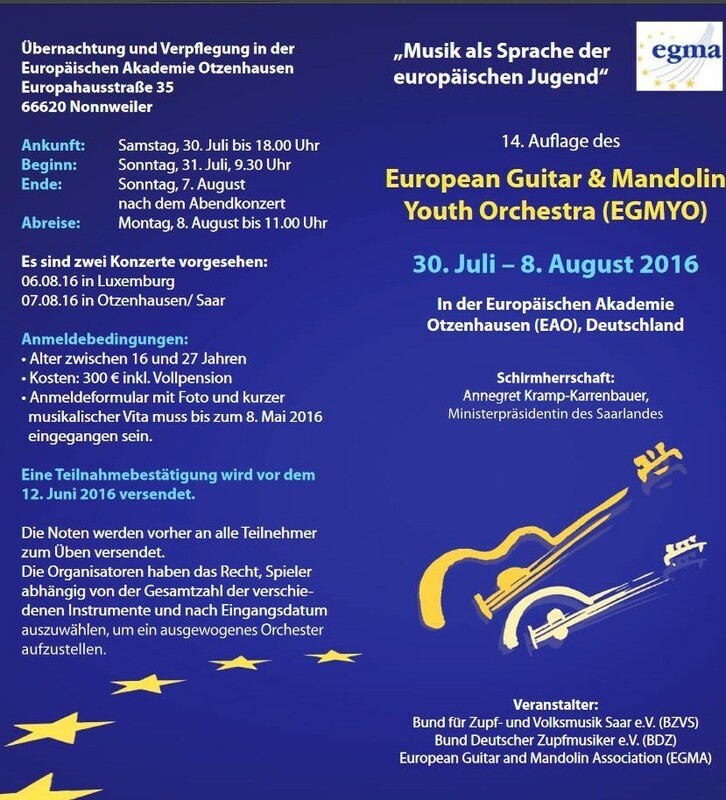 The second playlist EGMYO 2016 contains the complete videos of the final concert on August 7, 2016 which took place in the Academy in Otzenhausen. The concert from August 6 in Echternach is also availabe as a video. 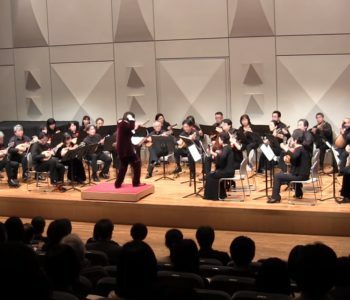 The program was composed of some very interesting compositions for plucked strings orchestra, including two pieces with accordion solo. 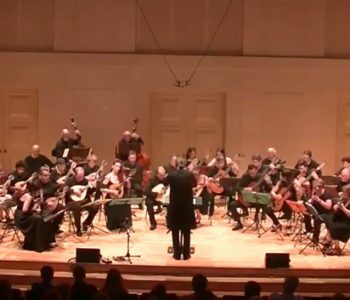 This playlist contains videos of all the compositions performed at the final concert of the EGMYO (European Guitar and Mandolin Youth Orchestra) under conductor Dominik Hackner at the European Academy in Otzenhausen on September 7th, 2016. Dominik Hackner – Sinzig (Germany), Conductor and overall artistic director, Conductor, composer and musical director of the Mülheimer Zupforchester, the LandesZupfOrchester NRW „fidium concentus“ and the Zupforchester Heimersheim. Vice-president of the BDZ. 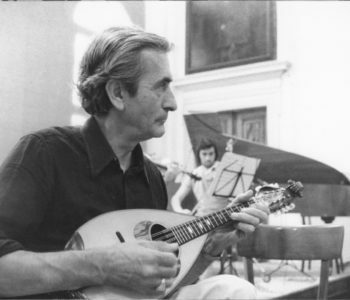 ffen Trekel – Hamburg (Germany), Mandolin 1 and Bandurria, tutor at the Hamburg Conservatoire and musical director of the German Federation of Plucked String Musicians. Sebastiaan de Grebber – Zwolle (Netherlands), Mandolin 2 and Bandurria, musician and teacher at the ArtEZ Conservatoire in Zwolle. Vincent Beer-Demander – Marseille(France), Mandola/Mandoloncello and Laúd, teacher formandolin at the Conservatoire Marseille and the Mandolin-Academy Marseille, composer and member of the CMF plectrum committee.